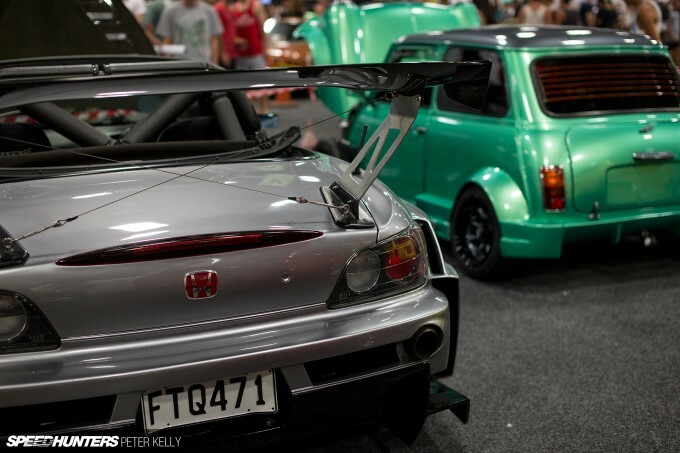 While there were plenty of cars I could have shone a more detailed Spotlight on at the recent 4&Rotary Nationals in New Zealand, just a few truly captured my attention. These cars didn’t have to be making the most power or be the most immaculately built, they just had to be ‘right’. 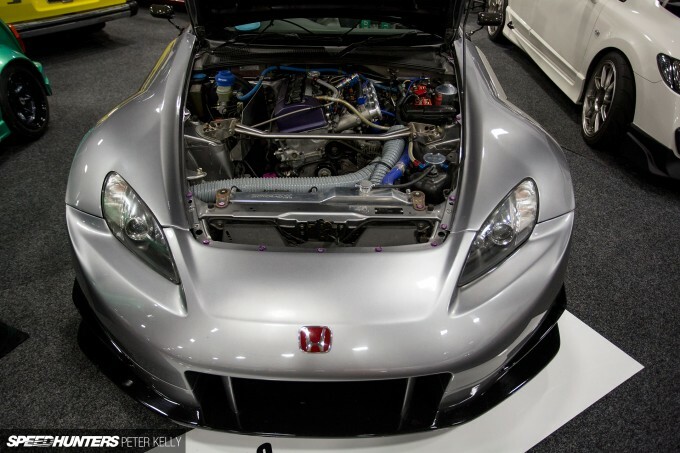 And that’s exactly how I think of this particular AP1 Honda S2000, built by JTune Automotive in Auckland. To me, this S2K is the perfect mix of style, aggression, performance and usability. In other words, if I had an S2000, this is very close to how I would build it. First, the body has been seriously muscled-up with a genuine Amuse GT1 kit, which while I have to say it doesn’t look right on some S2000s (perhaps it’s a colour thing? ), I think it really works on this darker-hued car. I especially love how angry the front fenders look from the rear. The high exhaust exits and carbon Voltex wing might cause contention amongst some readers, but to me, they really push the aggressive look of the car to just the right point. That’s because although this is a 100 per cent street car, it has also been built for serious weekend track work. With BC Racing ER coilovers, Ikeya Formula arms, Cusco braces and an ATS 1.5-way diff, the car is not just a poser – it’s well set up and absolutely hauls on local circuits like Pukekohe Park Raceway, south of Auckland city. Braking and handling are only part of the equation of course, especially on high-speed courses like Pukekohe, which requires some serious leg. And while the four cylinder DOHC VTEC F20C sitting in the busy engine bay may not look particularly flashy, it’s what’s inside that counts. The motor has been pushed up in capacity to 2.2 litres using a complete Toda stroker kit, while the heavily ported and polished head has also been enhanced using VTEC Killer cams, valve springs and rocker arm spacers from Toda, and Skunk valves and retainers. Perhaps the single coolest thing about this car though is the bark – something provided by TWM 2000 Series 52mm individual throttle bodies on the intake side, and Berk Technology headers dumping into a rowdy 3-inch system on the exhaust side. Tuned through an HKS F CON V Pro engine management system, the F2(2)C makes 254hp (190kW) at the wheels. 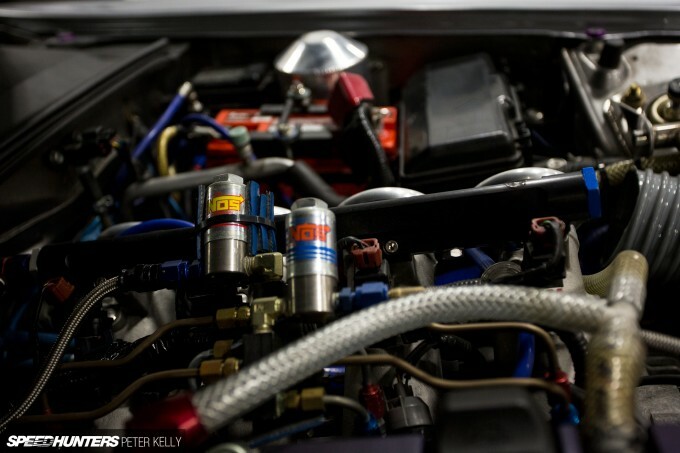 But with a little help from a NOS direct-port wet nitrous system, that figure can be pushed up to 348hp at the wheels. 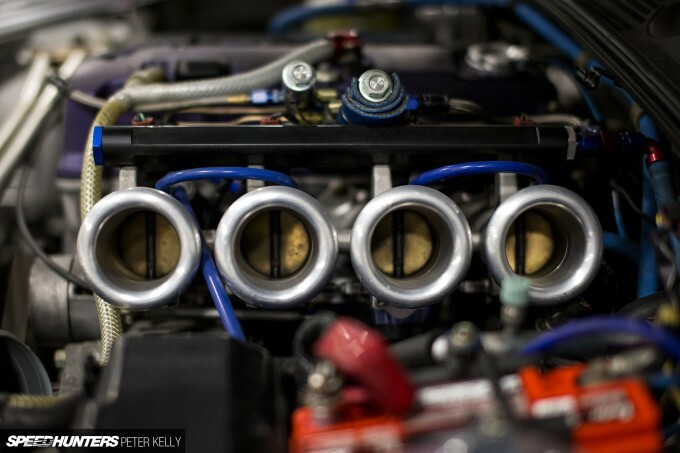 When speaking to the JTune guys at the show, they hinted at an impending turbo conversion. While extra power and speed is an admirable goal, personally, I love this S2000 exactly as it is. To me, it’s a perfect balance of screaming power and noise, on-point handling and braking, and of course the ability to drop jaws wherever it goes. Still, that’s the beauty of what we do, right? Everyone has a different idea on exactly what ‘perfect’ means. Wow, just awesome. Personally I hate those wing stands, but love everything about this car. Perfect amount of power and throttle response for the corners; and a little ace up the sleeve for straight line battles. I NEED IT!!! LOLZ Its official in my books. Hondas went from rice to nice. jacobherman14 Why a 20b? The 20b isn't the be all and end all of performance motors. Besides, with a 20b you couldn't REALLY call it the fastest s2000 ever. That's a look our power at the wheels for a NA engine of that size. I wonder how it daily drives. Guess your stuck at a show so you can't get a full side shot to see what the kit really looks like, couldn't they even shut the hood? Aren't those RPF1's not RP01's? The powertrain and suspension look nice but not sure about the body, from what can be seen it looks disjointed, round in front and square in back, but that's just personal preference. Appreciate the money spent but to me that has ruined the beautiful understated design of the car. Each to their own though! muhammadilham please dont bring facebook here. I love it...! Had always a soft spot for the S2K... My dream S2000 with a resonable design would be a AP2 model with the J's Racing front bumper, Voltex GT Wing and the Spoon Mooncraft Carbon hardtop.... If i had no limits in budget, it would clearly be the Amuse S2000 GT1 wide body!!! Do they run it open-top like that or do they have a hardtop for it? I really like that Amuse front end, and the revised exhaust exit is pretty cool too. I think I agree with you, ITBs+wide body+track days = just fine the way it is. Whats with the wires on the wing? gundanium2002 The cables put the wing in tension and triangulate it, allowing for the stays to be lighter than ones built to take the full side load unsupported. Basically it keeps the wing from flopping side to side. WOW That's aggressive yet really clean! CharlesChris15 eVox zapsnyder gundanium2002 Actually a circular cross-section is surprisingly bad, drag-wise. A tear-drop/aerofoil cross-section rod is very much better (hence why formula one suspension isn't made up of circular rods. But if the builder was worried about drag, and the wing was for actual aerodynamic function rather than aesthetics, he probably wouldn't have used those wobbly legs in the first place. Or mounted it to the boot lid. Or used a car with no roof. Lol I'm noticed that too. As an s2k owner I must say that thing is ugly. ruined all the body lines, terrible finish work on the roll bar, use of dryer hoses to get air to those admittedly beautiful itb's, and nitrous on a "track car". other than the motor which has a very nice parts list completely ruined. Just because a lot of money was spent on it does not make it better. FunctionFirst They just run the car open top like that - would look quite good with a hard top on it though! Gianluca FairladyZ Yea the Spoon hardtop is quite cool, but I can't help but feel it almost changes the shape of the car too much? Chri5 Duncan They are RPF1s, that's my mistake! I've corrected it, thanks for the heads up. Yes the kit's definitely not for everyone, and in the past I've seen images of the Amuse GT1 S2000s that I haven't liked, but this one I really did like - maybe it's the darker colour or maybe it's just that I'm seeing it in person. Jeats It's not too bad from what I've seen of it, but still not a whole lot of fun in traffic with the clutch I bet! Gianluca FairladyZ Peter_Kelly Why not get the optional hardtop from Honda? No need for ugly imo (but functional) hardtops from Mugen, Spoon, etc.? Love car overall though...ITB is villanous..first car mine with ITBs put me on love forever..
Yea, those wires are terrible for drag and they are also in the worst possible location. Beneath the airfoil. Clean, organized air flow underneath the airfoil is critical in producing negative lift/downforce. Arghrargh CharlesChris15 eVox zapsnyder gundanium2002 i highly doubt from the width of the wires that the drag is even measurable. Maybe, maybe not. It isn't the right way to do it either way. The eye bolts aren't installed correctly and the one directly underneath the airfoil isn't doing it any favors. None of this is important considering the lack of a hardtop. Matt Khoun muhammadilham I second that...A show about butchering cars. 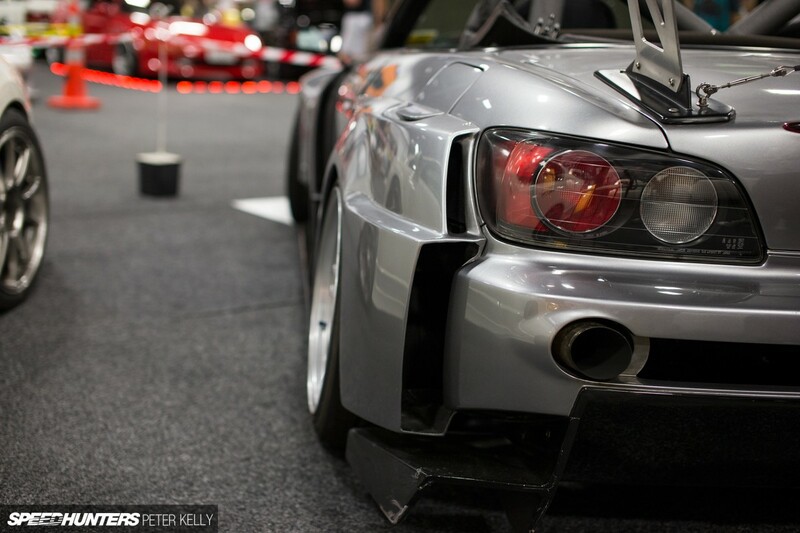 There`s nothing butchered about this S2k. jacobherman14 20b is a boat anchor. At least you didn`t say LS1!!!!11!!11!1!!! @Darkclark Owning an S2000 doesn't make your opinion any more valid so I can't see why you need to mention it. Glad I'm not the only one with jacked up rear diffusers lol.